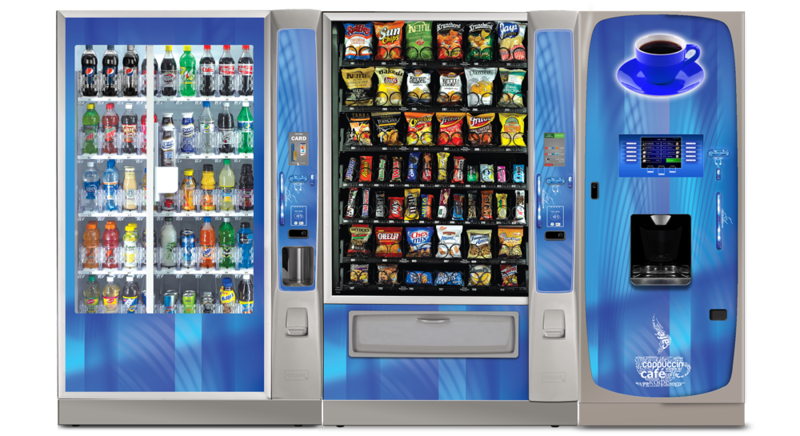 Global Vending can also provide vending machines that deliver customized coffee and cappuccinos at the push of a button! 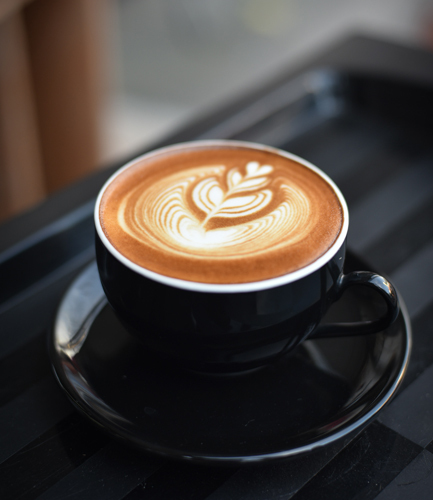 For that morning coffee, employees can skip the long lines, beat the traffic, and avoid the extra stop at the coffee shop knowing gourmet coffee awaits at work. Experience the pleasures of delicious hot beverages that rival the quality of any gourmet coffee shop. 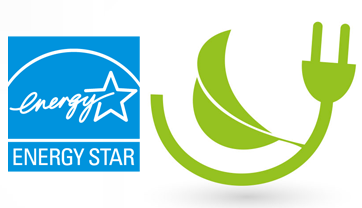 Enjoy exotic roasts, indulgent cappuccinos, cafe mocha, creamy hot chocolate and much more. 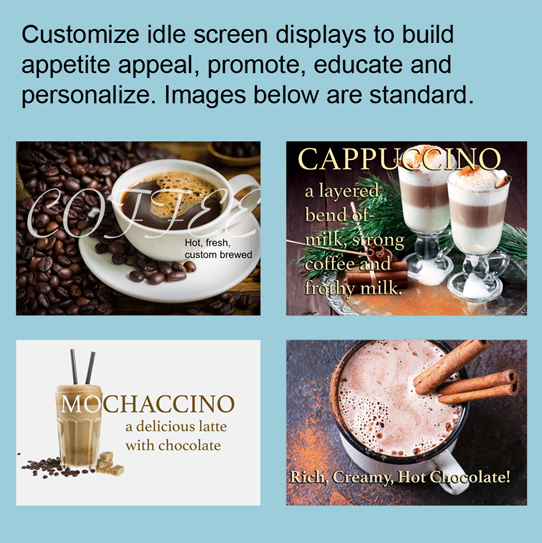 Satisfy every taste preference with Whole Bean or Fresh Brew Coffee, Cappuccino, French Vanilla, Cafe Mocha, English Toffee, Hot Chocolate and even custom recipe hot beverages. Employees can adjust strength levels and customize condiments to meet their individual tastes. 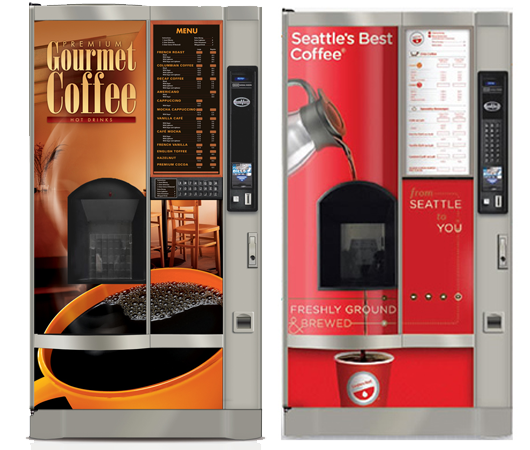 All machines feature FullBrew: a revolutionary brewing system that delivers gourmet quality coffee to your workforce. 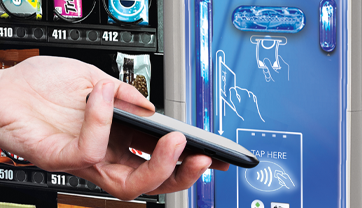 Beverages are brewed one cup at a time, on demand, in seconds. 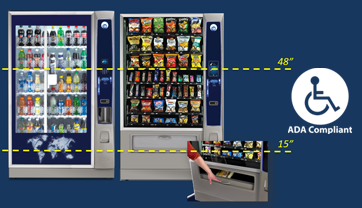 Our Hot Drink Center is the first coffee machine in the market that can deliver cup sizes up to 20 oz. 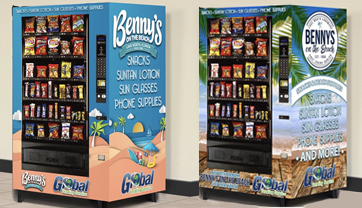 - just like you find at gourmet coffee shops, convenience stores and coffee kiosks. Perception meets reality. 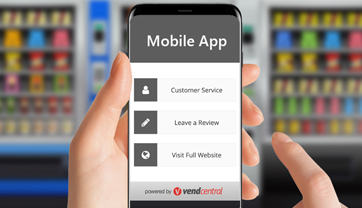 From the moment when a made-to-order selection is made, to choosing the most convenient method of payment, to the interactive messaging, to the delivery of a delicious finished product, VOCE MEDIA delivers a positive consumer experience. 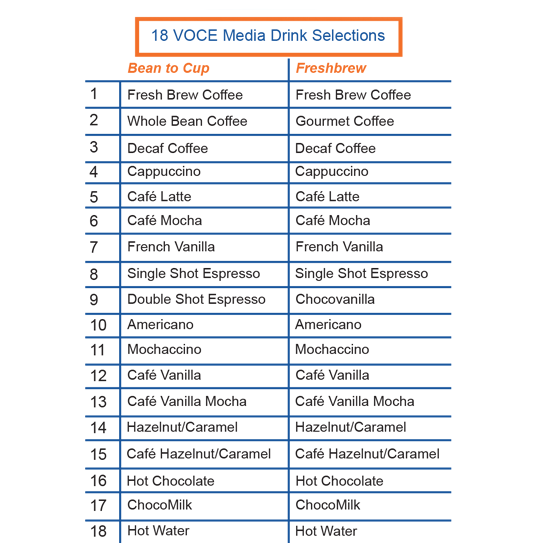 VOCE MEDIA serves barista style specialty beverages that broaden appeal to a wider variety of consumers. With the same brewing process as equipment used in the high end coffee retail channel, the VOCE MEDIA finished drink profile mirrors all of the important attributes of consistency, taste, aroma, color and appearance. 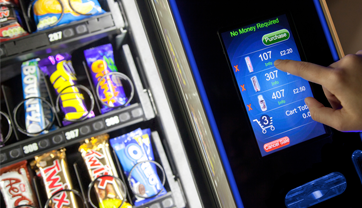 The VOCE MEDIA ATM user interface puts the consumer in control. Choose 18 selections; determine the strength of coffee, the amount of sugar or creamer to brew a drink specific to your taste. 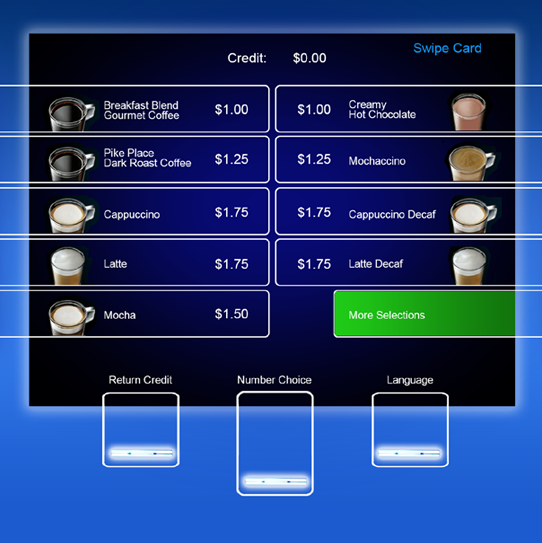 We’ll even give you a 4-digit PIN to order your custom drink on ensuing visits. VOCE MEDIA is a destination for great drinks, conveniently and consistently served. Moving your favorite coffeehouse closer to you... a lot closer. 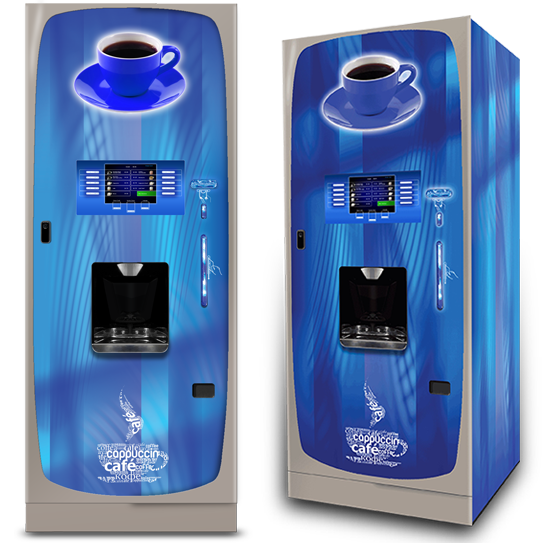 The Hot Drink Center comes equipped with FullBrew and SureVend technologies. FullBrew is a revolutionary brewing system that extracts full flavors and delivers gourmet quality coffee to your workforce. Coffees are brewed one cup at a time, in seconds. SureVend assures that each cup of coffee is successfully delivered to customers or they get their money back. 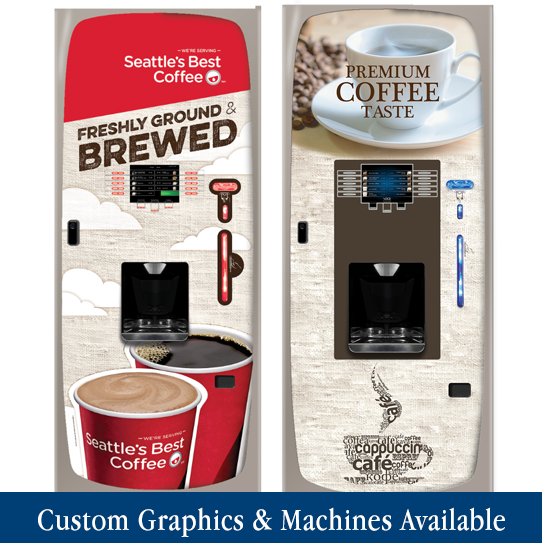 Satisfy every taste preference with Whole Bean or Fresh Brew Coffee, Cappuccino, French Vanilla, Café Mocha, English Toffee,Hot Chocolate and even custom recipe hot beverages. Employees can adjust strength levels and customize condiments to meet their individual tastes.